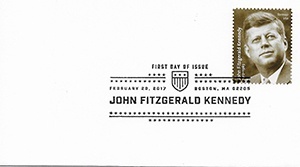 This year on Washington’s Birthday, Monday, February 20, 2017, I had the opportunity to attend the John F. Kennedy Forever Stamp First-Day-Of-Issue Dedication. The stamp is being released to celebrate the 100th anniversary of the birth of President Kennedy. The event was held at the JFK Presidential Library and Museum in Boston. In addition to the Kennedy family, Massachusetts politicians and JFK fans, the audience included USPS employees and industry professionals who serve on the Greater Boston Postal Customer Council. Most mailing events go unnoticed by the general public, but the room was packed, and an overflow room with closed-circuit television was required. The museum even broadcasted the event through Facebook Live. The line for stamps and cachets was longer than what you see at Starbucks on a Monday morning. While watching so many people celebrate the release of the new stamp, a thought cross my mind. Most production mail operations use meters or permit imprint indicia on their mailings. However, postage stamps and personal letters play an important role in our industry. And as mailers, we should do more to promote them. My father was an avid “First-Day-Of-Issue” stamp collector. When he was a postal clerk in the 1960s and 1970s, he loved bringing his collection to the local elementary schools to share with the students – and to get them to sign up as fellow collectors. After a supervisor said he could no longer make the visits during the workday, my father used his day off to continue recruiting new philatelists. Several years ago, I related his story to a good friend, Tony Williams, the District Manager of the USPS Northland District. A few days later, my father received a Priority Mail package from Tony – with bundles of “First Day” covers and commemorative stamps. That Saturday, we spent several hours sorting the cachets by date. And then my father mailed a thank-you note to Mr. Williams. He mailed a thank-you note to Mr. Williams. At seminars, workshops and conferences, we hear a lot about the importance of print and mail. Articles and blog posts point out that the physical document is an important part of the communication channel with customers. So, why don’t we follow these same principles into our personal correspondence? We don’t need to abandon email and social media as a way of staying in contact with our networks. It’s a smart way to do business. On the other hand, as print-mail professionals, we should find a way to include physical mail in our routines. We should follow the same advice that we give to customers – it’s not physical OR digital, it’s physical AND digital. Just as the industry has adopted color and images to enhance messages, we can say more through the stamps we choose. I use different stamps depending upon the recipient of the card or letter. To answer the next question – yes, I have received feedback on the stamp selection. Then again, many of my friends also work in the mailing industry. It’s time for all of us – postal employees, print providers and mail professionals – to pick up paper and pen, and start sending physical mail once again.